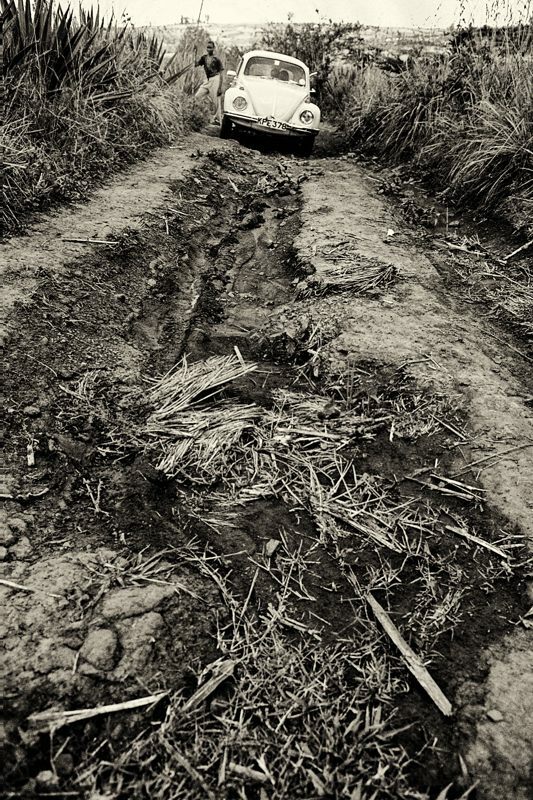 Back road through farms near Akala, in the far west of Kenya; April 1979. The wideangle lens makes the road appear in worse condition than it was – and, in any case, it was dry weather; tackling this in wet conditions would be something else again. The VW Beetle was wonderful for this sort of thing. No 4×4, just drive in the two rear wheels, the engine seated over the wheels – which made for very good grip – and a large metal plate underneath most of the length of the car, to guard against rocks and boulders. But the car took quite a hammering on this trip and, as I pulled out at the end of my stay for the long drive back to Nairobi, my front wheels had, unbeknown to me, taken such a pounding that they were facing outwards, i.e. away from each other. This very soon wore both tyres completely bald and, when I came upon a police road block, I had a hard job persuading them to let me through. Luckily there was an excellent garage specialising in VW repairs in Nairobi, and however badly I damaged the car, they were always able to fix it. Another thing about this picture is that it was taken in a very fertile, agricultural landscape teeming with people. I’ve only just stopped for a photo, and already there’s a young lad standing by the car. If we were really to get stuck or break down, there were always plenty of willing hands to help push and pull us on our way. They were friendly – and distinctly humorous – people. Less friendly was the malaria, which initially got its teeth into me during this safari. Technique: OM-1 with 28mm Zuiko lens; Agfa CT18 colour slide rated at 64 ISO; converted to mono in Silver Efex Pro 2, starting at the High Contrast Red preset. Farms between Kisumu and Kakamega in the lush and fertile, far west of Kenya; April 1979. 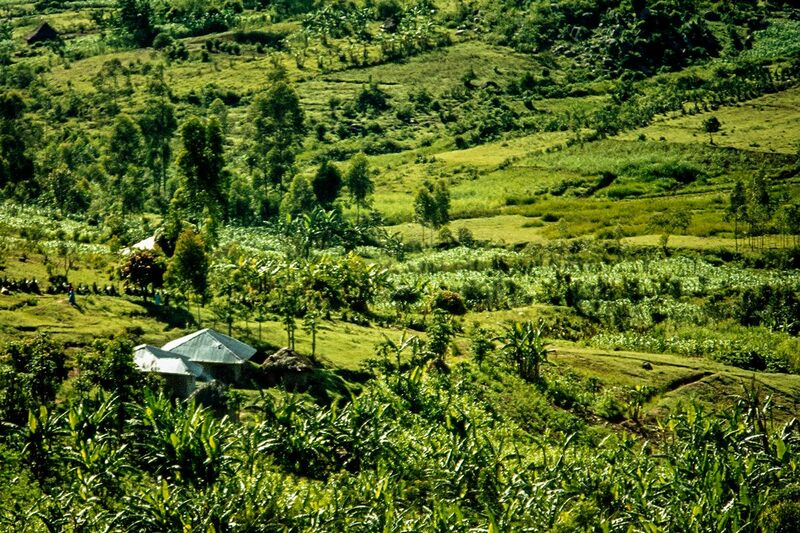 This western part of Kenya lies just to the east of Lake Victoria, and benefits from the big storms that form over the lake and then drift eastwards, bringing plentiful rain. Add all this water to fertile soils and high, year-round temperatures, and this is wonderfully productive farming country. But on the downside there is malaria here, and this is where it first got its claws into me. The tall plants in the foreground are bananas – there were many varieties of bananas of all sizes and colours here, including simply delicious ones used for cooking. It may be more a dish from Uganda, but I simply adored cooked banana – matoke, I think it was called – with groundnut sauce. Some of the local people can just be seen, up to the left of the two houses with metal roofs in the foreground. Technique: OM-1 with 28mm Zuiko lens; Agfa CT18 colour slide, rated at 64 ISO; Lightroom. 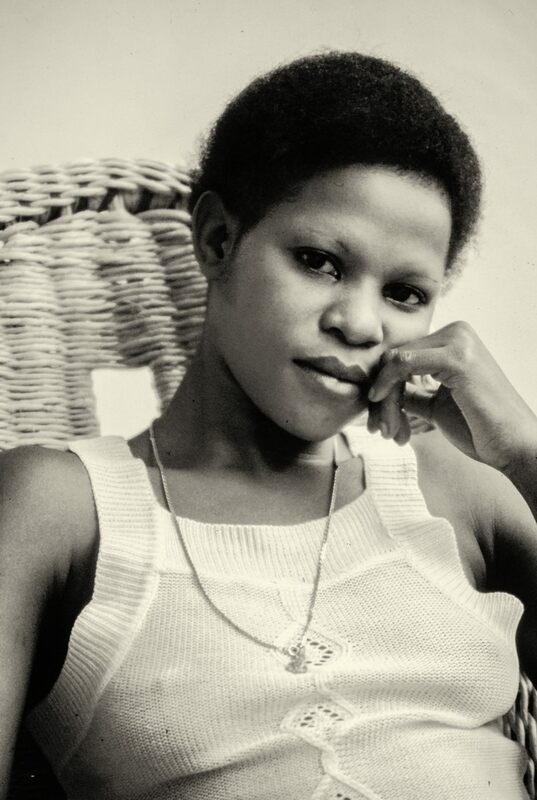 Young woman from Uganda, living in Nairobi; 1978/9. Technique: OM-2 with 75-150 Zuiko lens; Agfa CT18 colour slide, rated at 64 ISO; Lightroom; Silver Efex Pro 2, starting at the Warm Tone Paper preset. 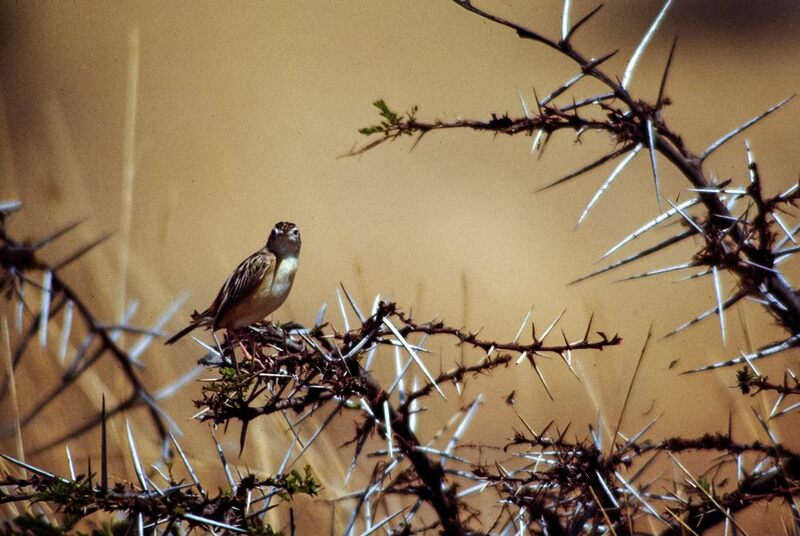 Small warbler – perhaps a Cisticola – amongst fearsome Acacia thorns, any one of which could so easily transfix it; probably in Nairobi National Park, in the late 1970s. The Cisticolas are a group of small warblers that that all look very similar to each other; they are the archetypal “small brown birds”. Technique: OM-1 with a Vivitar 400mm telephoto; Agfa CT18 colour slide rated at 64 ISO; Lightroom. This would have been taken from the window of my car, from one of the tracks in the National Park. Looking up at sunrise from Top Hut on Mt Kenya towards Nelion, one of the twin peaks of Mt Kenya; August 1978. Almost the roof of Africa! Nelion stands at 17,021 feet, while the other peak, Batian, rises to 17,057 feet. These two peaks are separated by the wonderfully named Gate of the Mists, and they are the tallest peaks in Africa second only to Mt Kilimanjaro, which is nearby in neighbouring Tanzania, and which soars to over 19,000 feet. 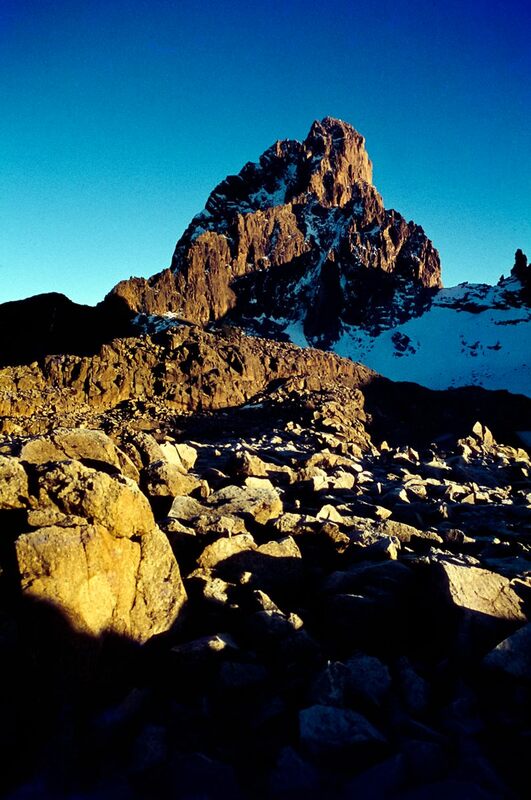 What was it like being up there on Mt Kenya? Well, taking this photo, it was extremely cold – I remember having trouble changing the lenses on my Olympus OM-1 SLR; they were very stiff to twist off, presumably due to the intense cold having slightly contracted the metal. Getting up to this altitude on the mountain required no rock climbing skills, it was simply a long walk, made more strenuous in its later stages by the decreasing oxygen content of the air – but after a day or so at these altitudes, breathing became easier. We were up there for several nights, sleeping in the various mountaineering huts around the peaks; and my abiding memories of those huts concern the rats which ran over and around us every night as we slept! Click onto the image to open another copy in a separate window, and click onto that image to enlarge it. 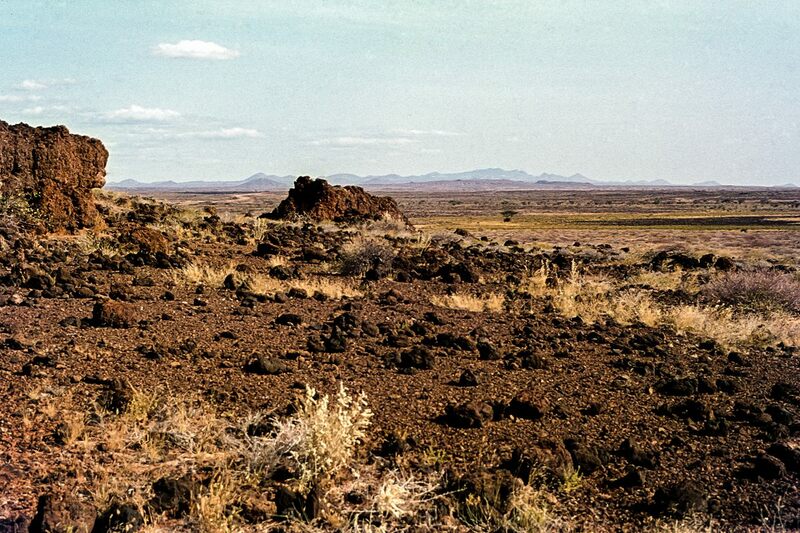 The view south in the rocky Dida Galgalla Desert of northern Kenya, with the volcanic highlands of Mt Marsabit on the horizon – each one of those far off peaks is a volcano – the picture can be clicked on and enlarged to show these a little more clearly. 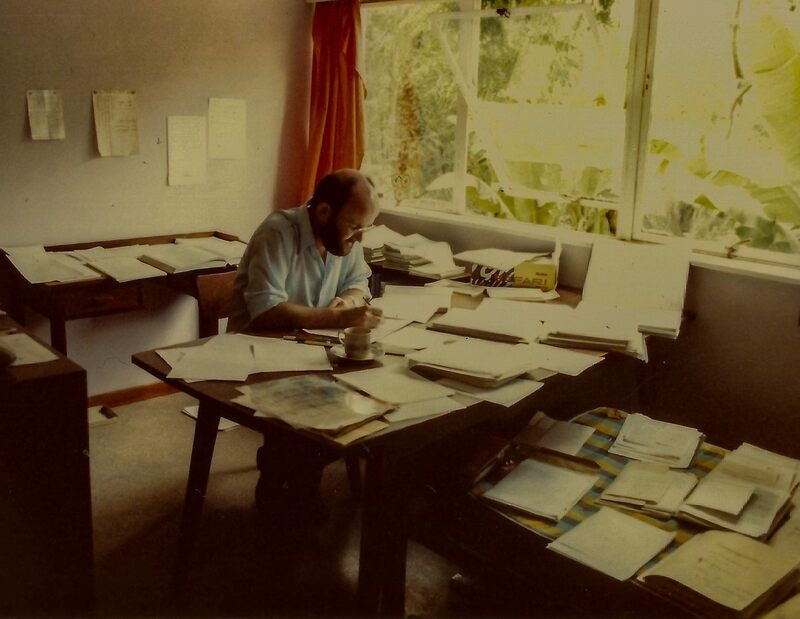 Photographed in the late 1970s. Having worked as a geologist in Arabia, and also being a naturalist, I have a great affinity for deserts – their often harsh and desolate emptiness, the huge skies, the intriguing wildlife. Those familiar with pictures of the sand seas of the Sahara will find none of that here – this is a rocky desert – and its more of a semi-desert >>> sparse and bleached plant life can be seen, and after rains the whole area will briefly become green, but briefly is the operative word here, most of the time it looks like this. One other thing to mention. Look at the small rock outcrop close to the camera, and just above the centre of the picture – and then look just to the left of it. That glimpse of a far off, twisting, sandy (and rocky too!) track is in fact the A2, the main road through this part of northern Kenya up to the Ethiopian border at Moyale. How I remember bouncing and crashing around on that road, as we went north looking for desert birds on fascinating and exciting journeys. But I never drove the whole way to Moyale. Instead, intent on gathering data for a bird atlas, we flew in, twice, from Nairobi I think. And I seem to remember our little aircraft landing in Ethiopia but coming to a halt in Kenya – but that may just be a fanciful thought from long ago. Grant’s Gazelle, in the blazing overhead light of the equatorial midday; Nairobi National Park, Kenya; the late 1970s. Despite being mainly a birder, I shot thousands of photos – mainly colour slides (transparencies) – while living in Kenya. Some years back now, around the time I was starting up this blog, I scanned many of these photos, and others too, into digital – and now, looking through the folders on my computer, I’m rather taken aback to discover just how many of these scans there are! 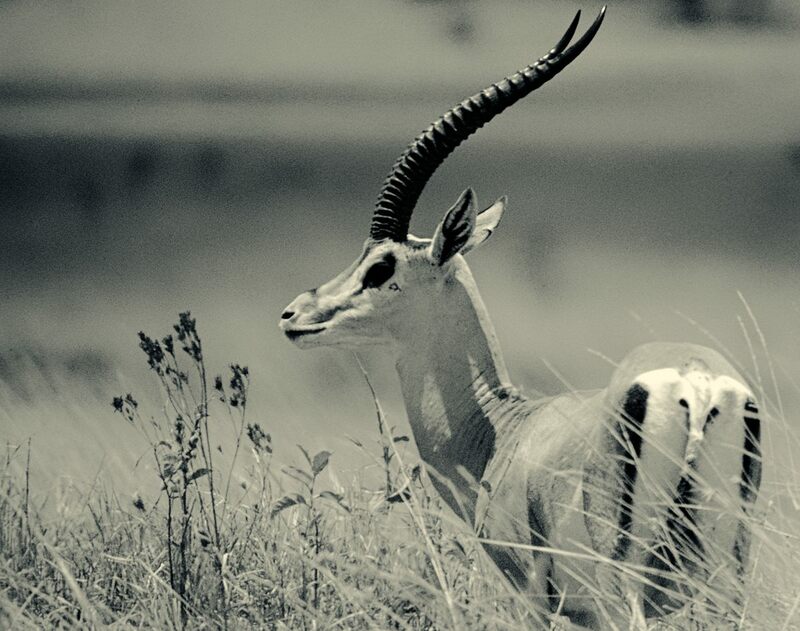 Many of these scans have already been posted, but here is one that has yet to see the light of cyberspace – Grant’s Gazelle, one of the common, smaller antelopes on the open plains of Kenya. Click onto the image to open a larger version in a separate window, and clock onto that image to enlarge it still further. Technique: OM-1 with 75-150 Zuiko lens at 150mm; Agfa CT18 colour slide; Silver Efex Pro 2, starting at the Cool Tones 2 preset. 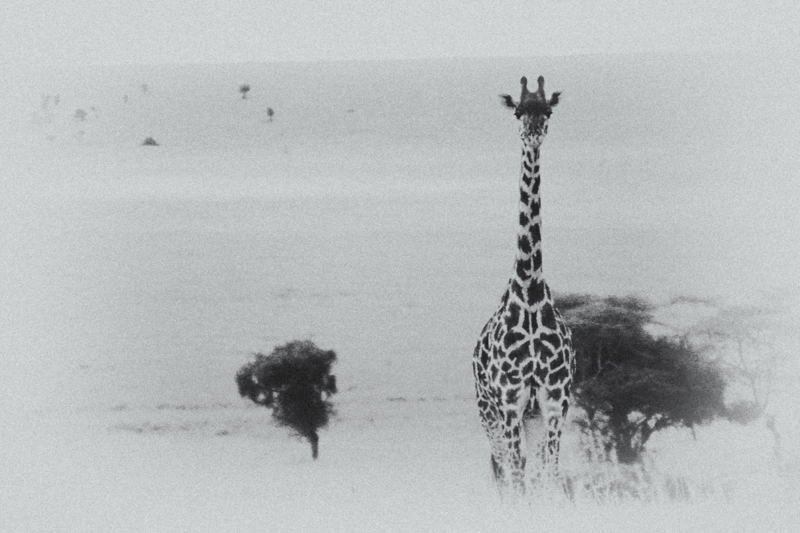 Maasai Giraffe, Nairobi National Park, Kenya; probably late 1970s. Although this is a portrait of a wild animal, and so a representation of the natural world, it is also partly abstract. The animal is (more or less!) in focus, but behind it, even close behind it, the landscape is only diffusely visible. Looking at this very limited depth of focus, I think this must have been taken with an old Vivitar 400mm telephoto that I had in those far off days. Composition: in terms of the “rule” of thirds, the giraffe occupies the right vertical third of the photo (i.e. the vertical line about one third of the way into the image from the right margin), which is a visually strong position in which to be. The thornbushes immediately behind the giraffe are out of focus, and those further out towards the (just about visible) horizon are more diffuse still. This gives a sense of distance and depth. Technique: use of Nik Software’s Silver Efex Pro has added a slightly bluish tint to the image, and rendered the out of focus areas still more diffuse. These effects are enhanced by the addition of a pale vignette, a quite thick zone of pale diffusion right around the image’s borders, the effects of which are best seen to the right of the bush immediately behind the giraffe, and on the distant bushes in the image’s top left corner. 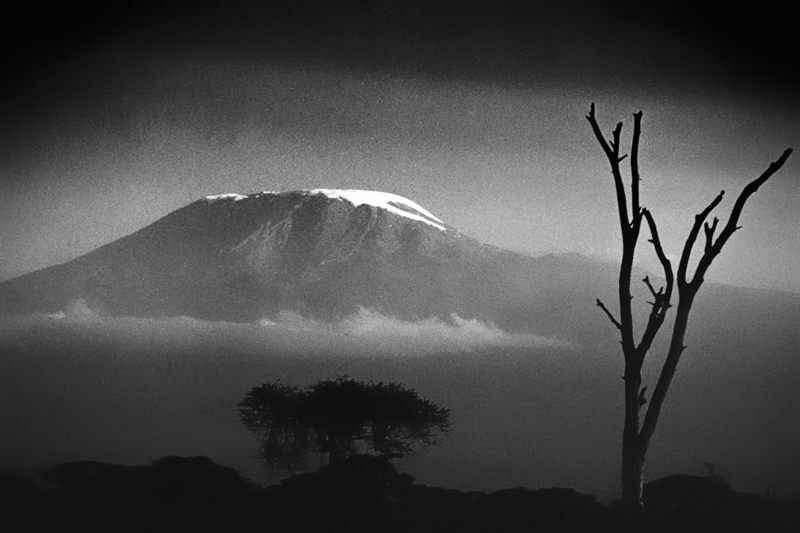 Mt Kilimanjaro, Africa’s highest mountain, seen from Kenya’s Amboseli Game Reserve; July 1978. There is another Kilimanjaro image here . Technique: OM-1 with 75mm-150mm Zuiko lens; Agfa CT18 colour slide rated at 64 ISO; converted to mono in Silver Efex Pro 2.